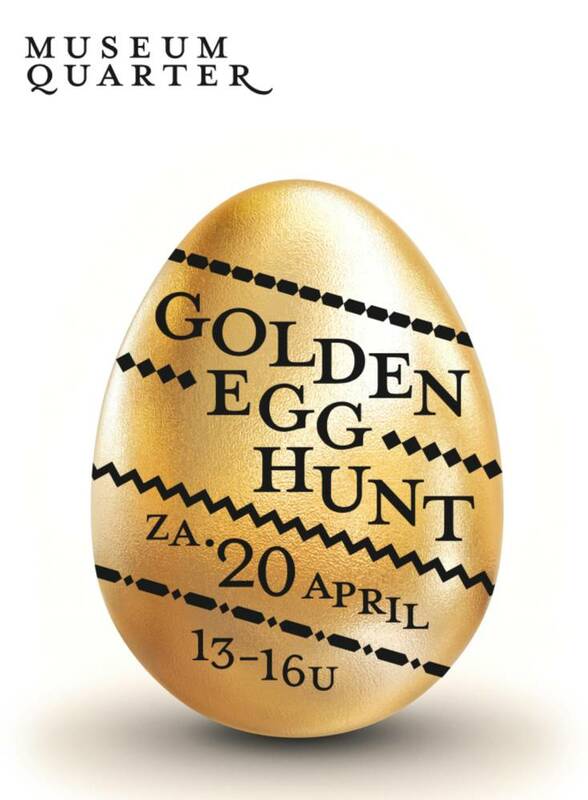 Golden Egg Hunt in Museum Quarter - Museum Quarter Amsterdam - best musea, fashion & restaurants. On Saturday the 20th of April, The Amsterdam Museum Quarter turns into a live Egg Hunting field. Between 13:00 and 16:00 PM Easter Bunnies are jumping around everywhere with baskets full of Easter Eggs. Some of these are Golden and worth a price. So, what are you waiting for! Come join the Golden Egg Hunt for some serious family fun.Joining The Golden Egg Hunt is free of charge. And starts at the Egg Desk at the Van de Veldestraat (near number 2-4). Here you receive a participant strap. And the hunting fun begins. Do you see an Easter Bunny? Show your strap and grab an Easter Egg from the basket. Is it a Golden Egg? You won! Pick up your price at the Egg Desk. And jump for joy. With special thanks to all participating BIZ partners: Azzurro Kids, Bagels&Beans, Cobra Art Gallery, Cobra Cafe, Het Concertgebouw, Coster Diamonds, Gant Store Amsterdam, Huize van Wely, Kort Shoes, District 1071, Max Brown, Park Hotel, Petit Bateau, Rijksmuseum, Stedelijk Museum and Van Gogh Museum. - Participants go to the Egg Desk at Van de Veldestraat (near number 2-4) to receive a participant strap. - The Easter Bunnies move around in the area specified by the organization. - They can also be inside shops in the area with a Golden Egg Hunt sticker. - If the participant finds an Easter Bunny, he of she can grab an Easter Egg from the basket by showing the Participant Strap. A Golden Egg can be exchanged for a prize at The Egg Desk. - Some prizes are handed over at The Egg Desk, others are offered as a voucher, exchangeable at the provider. - Prizes are offered at the discretion of the participating companies. They cannot be exchanged and cannot be exchanged for money. -There will be no correspondence about the results. - Only 1 prize will be rewarded per partcipant.